Dr. P.K. 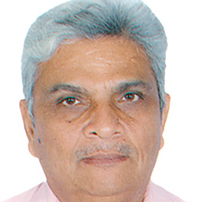 Sharma, MBBS, MD, FISCD has been working as Director & Medical Officer of Health since 01.06.2007 in NDMC. Various units of Health Department have reached pinnacle during his tenure as MOH & Dir. (Health). NDMC was adjudged one of the best cities of India by Ministry of Urban Development, Govt. of India. The excellent quality of sanitation of NDMC has been acknowledged by Chief Secretary, Chief Minister and other Apex bodies like Supreme Court of India. Under his guidance, NDMC achieved Second Runner-Up Award by Confederation of Indian Industries for Solid Waste Management in the category of Municipal Body in June, 2010. He was institutional in bringing glory to NDMC and India during the Commonwealth Games 2010 in Delhi, by maintaining the Commonwealth Game Village as per international standard in relation to environmental sanitation. He led a team of 700 workers over there although it was not in NDMC area. All the public health activities in NDMC area as well as various stadia in NDMC were maintained upto the optimum. None of the player or the international visitors suffered with water or vector borne diseases. The work of NDMC was acknowledged by the media and all dignitaries at all corners. For the first time an Italian Air Purifier imported from Italy was installed in Connaught Place to see the air quality and measurement of pollution in NDMC area as a Pilot Project. Under his tenure as MOH, State-of-Art Public Toilets Units (225 PTUs) were completed on BOT basis as a PPP Project for the use of general public free of cost. He has pioneered Computerization of Birth & Death Unit of NDMC. Online registration of birth and death data by various hospitals in NDMC jurisdiction has also been started under his tenure. A pollution related mortality study was done in collaboration with the World Bank USA. The research paper of this study was published in American Journal of Agriculture Economics. Extended distinguished services in Jagatsinghpur Orissa from 9th November to 24th November, 1999 after the cyclone disaster on the directions of the Hon’ble Prime Minister of India. HIV / AIDS Control Program – Prepared HIV/AIDS prevention and control program in NDMC area. Opened a State-of-Art VCTC for diagnosis of HIV infection and counselling activities. The Centre recently got recognition from Govt. of NCT of Delhi and NACO. Under the umbrella of quality council of India, up-gradation of all health care units has been initiated. NABH Accreditation of Dispensaries is a pilot project of India. Under his guidance NABH Accreditation has awarded to the First Urban Health Centre (MCW Centre + Allopathic Dispensary) of NDMC being an example in India.